If you keep your eyes peeled as you drive along Great Northern Road, you’ll spot a new commercial vehicle which is the only one of its kind in the Sault. 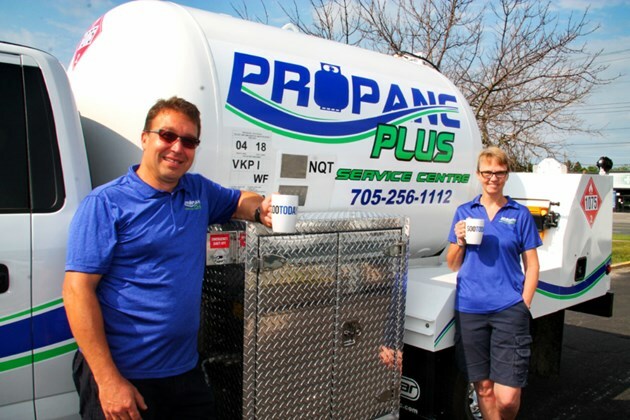 Matt Muncaster, Propane Plus Service Centre’s owner/operator, has recently commissioned a new, compact propane tank refilling vehicle, small enough to deliver propane tank refilling services for customers in tucked away places. “It’s unique. It’s smaller than any of the big fuel trucks so we can get into cottages for customers. It’s four wheel drive and has a cylinder cabinet on the side so we can go into campgrounds and actually fill all sizes of cylinders or actual tanks located at peoples homes, and because it’s four wheel drive we can get right in there at cottages,” Matt said as he accepted a pair of complimentary SooToday coffee mugs. The Ford F 550 truck was purchased by Propane Plus last fall, then specially modified in southern Ontario before going into service in June. “It’s been received well. We’ve been going to campgrounds and people think it’s the greatest thing because people don’t have to haul their propane tanks to town to get filled. Business is building very quickly, actually,” Matt said. “It gives us an edge because there are only two big propane companies that deliver fuel and they have huge trucks that can’t get into some of these places, so this truck is a big help,” Matt said. Propane Plus refills cylinders for customers with barbecues, heaters, propane-powered forklifts, motor homes with propane on board as well as having a wide range of barbecues, fireplaces and accessories on sale in the shop. Spring, summer and fall months are the busiest for Propane Plus, but the business offsets the slower winter months by selling and installing furnaces and fireplaces, offering undercoating for vehicles at the shop’s garage, Propane Plus also being a U-Haul agent. Matt, a Sault native, operated a Superior Propane outlet in North Bay in the 1990s before moving back to his hometown and opening up Propane Plus in 1999. 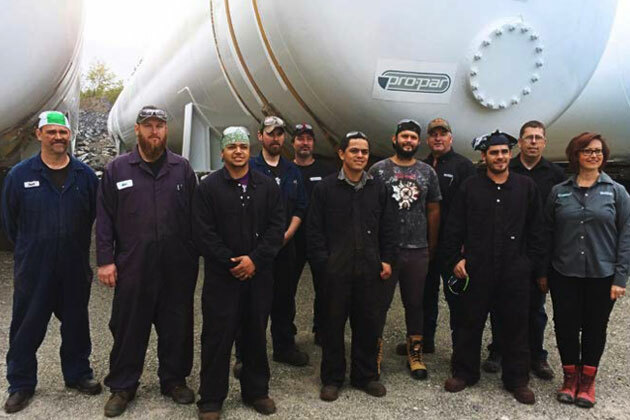 “I went to school for mechanical engineering in the early 1990s and I was working for Superior Propane while I was in college, and the operator of the store in North Bay was retiring, so I took the opportunity to own that store and never looked back. It turned out to be great for me. I enjoy being an entrepreneur,” said Matt, who employs six people at Propane Plus at 60 Great Northern Rd., right beside Cambrian Mall.